Netinsat provides fast internet connection everywhere, using the smartest solutions. Mobile Internet at the highest speed available in Italy, in the Mediterranean countries, in the Caribbean islands or Worldwide. High-Throughput Satellite connections for business and offers a wide range of secure and reliable services optimized to your connection needs: always on connectivity with a flat rate, one year subscription or limited period like in the yachting season. 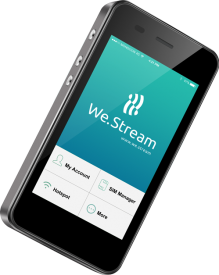 We.Stream is your personal and Secure Mobile Hotspot with embedded Cloud SIM technology to enable unlimited data in 100+ countries. Internet access over dedicated wireless network. The hotspot features, as the captive portal with authentication or optional payment with credit card, can be used everywhere you need to share internet access: an hotel, on a ferry, a cruise line, an oil rig or in a cafe. The Wi-Fi hot spot is compliant with the Italian legal obligations. SIP Trunking end-to-end solution optimized for VSAT networks.